The Thomas Fire in December 2017 is the largest in recorded California history. It began in Ventura County in early December and ultimately reached well into Santa Barbara County during its 44-mile long run. At the peak, more than 8,000 firefighters fought the blaze that saw 16,000 residents under mandatory evacuation order and 12,000 in the evacuation warning area in Santa Barbara County alone. 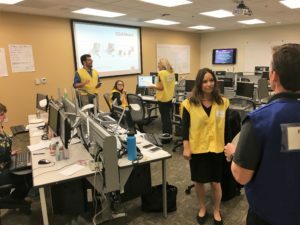 SAE Communications is called in to assist various public agencies manage their Joint Information Center during an incident; Santa Barbara County is one such entity. SAE served as the JIC manager in the first days of Thomas to assist in getting many of the systems and staffing up and running. Via their retainer with Santa Barbara County, SAE responded within moments of the start of the 2016 Sherpa Fire in the front country of the County and visible to the entire South Coast. 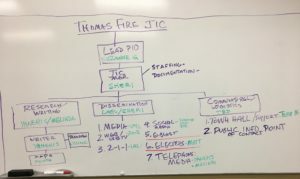 The initial steps included establishing a Joint Information Center (JIC) staffing structure, media monitoring and incident assessment. These steps have set the framework for future success during emergencies. Check out the after-action JIC report here. The Refugio Oil Spill located along the scenic Gaviota Coast was among the most complex disasters in California history. 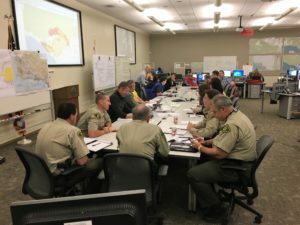 The Unified Command involved 8 agencies, including Santa Barbara County, the U.S. Coast Guard, the California Office of Emergency Management, etc. The County’s Emergency Operations Center was the hub of all incident activity, including a Joint Information Center. Both SAE principals responded to the initial incident call-out and one or both stayed on scene for the first weeks of the incident. The myriad issues made this a vexing and incredibly challenging task for the local agencies: how to convey to local residents that their precious coast was being protected while ensuring the local oil industry was not being hampered. Did we say vexing? SAE responded within hours to the community of Seal Beach following the worst mass shooting in Orange County history when a gunman shot and killed eight people in a beauty salon in this small seaside town. Using our extensive network of PIO colleagues, we arranged for an experienced crisis communicator to arrive on scene early the morning after the incident to provide media relations counsel and support – he remained of service through the “PIO mutual aid” effort for the first three days. By the afternoon of the second day, an SAE principal arrived on scene and remained onsite for the first week, working side-by-side with the city manager, the mayor and city council, and city staff to help guide the overall emergency response, from handling media from around the world to when/how to hold a candlelight vigil to helping coordinate the funerals for the victims. As we worked on scene into the second week after the incident and the media spotlight remained focused on the community, we helped address two complex challenges: how to quickly set up a method by which people from around the world could donate to a victim’s fund and how to handle the hundreds of calls of offers of assistance. A trust was established in partnership with the chamber of commerce to ensure donated funds would be devoted exclusively to the needs of the families while a complex system of documenting offers of help was created. SAE provided assistance in the immediate aftermath of the Isla Vista mass shooting where six UCSB students were killed. SAE initially provided the County Executive Officer’s office with a “road map” that outlined a tremendous array of issues to address, from corralling the media to preparing elected officials to ensuring a coordinated effort among various responding agencies. Of particular need was equipping the County’s mental health officials with comments and supporting them with training. Our focus soon turned to assisting the mental health team to prepare for a Barbara Walters special focusing on the mental stability of the perpetrator and the role of public entities to not just respond but to help prevent these types of tragedies. Most interestingly, he immediately went to the media to deliver his messages . He also went online to the most adversarial online news/comment aggregator in town to post a statement in response to some really harsh online criticism. While his staff felt this was not a good move, SAE’s counsel was to post a comment and allow the community to know his sincere feelings. Check the online site/comments here. Note the negative comments before the Chief’s posting and positive comments after. Pretty interesting. SAE responded immediately to assist the City of Long Beach as it began an investigation into the mishandling of an animal brought into the facility as well as the licensing of facility staff. Our team brought together everyone involved in this complex issue to ensure everyone had accurate and up-to-date information. We then prepared key messages, a question-and-answer document, and various statements. A media briefing was arranged where the issue was brought to the attention of the public and clear actions were explained, thus ensuring the agency “self reported” versus waiting for the news to “leak” out. Media coverage was accurate and balanced. The death of an animal while under the protection of the local animal shelter is not only a tragedy for the dog and its owners, but also for the public agency responsible. We were asked to assist when a shelter employee accidentally left a gate open which allowed dogs to mix and resulted in the death of a shelter dog. Santa Barbara County knew it needed to report the incident to the public; however, how to announce and what details to include were vexing. We immediately assisted staff in the preparation of a detailed statement, acknowledging the tragedy and that its own employee was responsible. However, additional details were made public that provided a much fuller picture of the entire situation.